Bulgaria, officially the Republic of Bulgaria, is a country in south Eastern Europe, bordering five countries: Romania to the north (mostly along the Danube), Serbia and the Republic of Macedonia to the west, and Greece and Turkey to the south, as well as the Black Sea, which comprises its entire eastern border. The region was once inhabited by the ancient Thracians, and was later inhabited by Greeks and Romans. It is a successor of the powerful European Bulgarian medieval empire, which at times covered most of the Balkans and spread its culture and literature among the Slavic peoples of Eastern Europe. With a population decline of 1.5 million since 1989, Bulgaria faces a demographic crisis that will have an impact on its economic well-being. Bulgaria was allied with the Axis Powers during World War II but was one of three countries (with Finland and Denmark) that saved its entire Jewish population (of around 50,000) from the Nazi camps by refusing to comply with an August 1943 resolution. The name “Bulgar” is believed to derive from a Turkic verb meaning "to mix." Ethnic Bulgarians descend from the merging of Bulgars, a central Asian Turkic people, and Slavs, a central European people, beginning in the seventh century C.E. 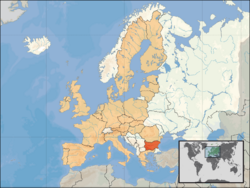 Noted for its geographically and climatic diversity, Bulgaria borders five countries: Romania to the north (mostly along the Danube), Serbia and the Republic of Macedonia to the west, and Greece and Turkey to the south, as well as the Black Sea, which comprises its entire eastern border. The land area of Bulgaria is 42,823 square miles (110,550 square kilometers), slightly larger than that of Iceland or the state of Tennessee. Bulgaria comprises portions of the classical regions of Thrace, Moesia, and Macedonia. The landscape ranges from the Alpine snow-capped peaks in Rila, Pirin and the Balkan Mountains to the mild and sunny weather of the Black Sea coast, from the typically continental Danubian Plain (ancient Moesia) in the north to the strong Mediterranean influence in the valleys of Macedonia and the lowlands in the southernmost parts of Thrace. The southwest of the country is mountainous with two alpine ranges, Rila and Pirin, and further east are the lower but more extensive Rhodope Mountains. The Rila mountains include the highest peak of the Balkan Peninsula, Musala, at 9,596 feet (2,925 meters). Hilly country and plains are found in the southeast, along the Bulgarian Black Sea coast in the east, and along the Danube river in the north. The climate is temperate, with cool, damp winters, hot, dry summers, and a Mediterranean influence along the Black Sea coast. The barrier effect of the east-west Balkan Mountains is felt throughout the country: Northern Bulgaria is slightly cooler and receives more rain than the southern regions. Average precipitation is about 25 inches (630 millimeters) per year. 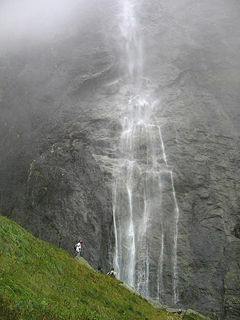 The driest areas are Dobrudzha and the northern coastal strip, while the higher parts of the mountains Rila and Stara Planina receive the highest levels of precipitation. In summer, temperatures in the south of Bulgaria often exceed 104 °F (40 °C), but remain cooler by the coast. The country is relatively rich in mineral resources, including vast reserves of lignite and anthracite coal; non-ferrous ores such as copper, lead, zinc and gold. There are large deposits of manganese ore in the northeast. There are smaller deposits of iron, silver, chromite, nickel and others. Bulgaria is rich in non-metalliferous minerals such as rock salt, gypsum, kaolin, and marble. The Danube is Bulgaria's main river. Other major rivers include the Struma and the Maritsa in the south. There are approximately 260 glacial lakes situated in Rila and Pirin, several large lakes on the Black Sea coast, and more than 2,200 dam lakes. Mineral springs are in great abundance located mainly in the southwestern and central parts of the country along the faults between the mountains. Bulgaria has more than 250 endemic plants. These include the Rila primrose, Balkan violet, Bulgarian blackberry and Rhodopean tulip. Forests have wild fruits, briars, blueberries, blackberries, raspberries, strawberries and mushrooms, as well as a variety of herbs and healing plants. Bulgaria's fauna numbers some 13,000 species. Pelicans, stags, deer, wild goats, quail, and pheasants populate reserves and hunting grounds. A network of three national parks has been set up (Rila, Pirin, and the Central Balkan); nine natural parks; reserves, as well as 2,234 protected territories and natural landmarks. A significant portion of Bulgaria is prone to earthquakes. Two especially sensitive areas are in the Gorna Oryahovitsa area in north-central Bulgaria, and a wide area extending through the Rila and northern Pirin regions to Plovdiv in south-central Bulgaria. Sixteen major earthquakes struck Bulgaria between 1900 and 1986, the last two in Strazhitsa on the Skopje-Razgrad fault line. Together, the two earthquakes damaged over 16,000 buildings, half of them severely. In 1991 Bulgarian environmentalists estimated that 60 percent of the country's agricultural land was damaged by excessive use of pesticides and fertilizers and by industrial fallout. In 1991, two thirds of Bulgarian rivers were polluted, and the Yantra River was classified as the dirtiest river in Europe. By that time, about two-thirds of the primary forests had been cut. Perhaps the most serious environmental problem in Bulgaria was in the Danube port city of Rousse. From 1981 to 1989, the chemical pollution that spread from a chlorine and sodium plant across the Danube in Giurgiu, Romania, was a forbidden subject in Bulgaria because it posed a threat to good relations between two Warsaw Pact countries. 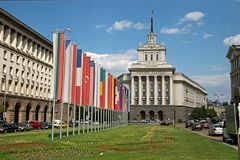 Sofia is the capital and largest city of Bulgaria, with a population of 1,246,791 (making it the fifteenth-largest city in the European Union). One of the oldest capital cities in Europe, the history of Sofia dates back to the eighth century B.C.E., when Thracians established a settlement there. Other cities include Plovdiv (376,918), Varna (345,522), Burgas (259,985), Rousse (176,118) Stara Zagora (163,193), Pleven (121,700), Dobrich (115,861), and Sliven (106,434). Early Neolithic (c. 8500 B.C.E.) remains have been discovered near Ohoden village, Bulgaria. The Neolithic era was the end of the Stone Age and the beginning of the farming era. The Gradeshnitsa Tablets, discovered in southern Bulgaria, appear to point to Bulgaria as home of one of the world's oldest known writing systems, preceding the Sumerian and Egyptian hieroglyphics by nearly two millennia. These are preserved and under study in the Vratsa Museum. Thracians, a group of ancient Indo-European peoples who spoke the Thracian language, were the earliest known people to inhabit what is now Bulgaria and are direct ancestors of the modern Bulgarian nation. They were divided into numerous tribes until King Teres united most of them around 500 B.C.E. in the Odrysian kingdom, which peaked under the kings Sitalkes and Cotys I (383-359 B.C.E.). In 341 B.C.E., it was destroyed by the Macedonian state but rose from its ashes at the end of the fourth century B.C.E. under Seuthes III. In 188 B.C.E., the Romans invaded Thrace and the wars with them continued to 45 C.E., when Thrace became a Roman province. It is believed that the oldest handcrafted gold treasure in the world, the 6,500-year old Varna treasure of Eastern Bulgaria, is Thracian-made. One of the most talented ancient commanders, Spartacus, was a Thracian born in the middle Struma region. The migration of Bulgars, a Central Asian Iranian or Hurrian-Mitanni people, to the European continent started as early as the second century when branches of Bulgars settled on the plains between the Caspian and the Black Sea. Between 351 and 389 C.E., some of these crossed the Caucasus and settled in Armenia. Swept by the Hun wave at the beginning of the fourth century, other numerous Bulgarian tribes migrated from central Asia to the fertile lands along the lower valleys of the Donets and the Don rivers and the Azov seashore. Some of these remained for centuries in their new settlements, whereas others moved on with the Huns towards Central Europe, settling in Pannonia. The Bulgars merged with the local Romanized and Hellenized Thracian and Slavic inhabitants in the late seventh century to form the first Bulgarian state. The Bulgars were governed by hereditary khans. There were several aristocratic families whose members, bearing military titles, formed a governing class. Bulgars were monotheistic, worshipping their supreme deity, Tangra. In 632, the Bulgars, led by Khan Kubrat, formed an independent state known as Great Bulgaria, bounded by the Danube delta to the west, the Black Sea to the south, the Caucasus to the southeast, and Volga River to the east. Byzantium recognized the new state by treaty in 635. Pressure by the Khazars led to the loss of the eastern part of Great Bulgaria in the second half of the seventh century. Some Bulgars from that territory later migrated to the northeast to form a new state called Volga Bulgaria around the confluence of the Volga River and Kama River, which lasted the thirteenth century. Kubrat’s successor, Khan Asparuh, migrated with some Bulgarian tribes to the lower courses of the rivers Danube, Dniester and Dniepr (known as Ongal), and conquered Moesia and Scythia Minor (Dobrudzha) from the Byzantine Empire, expanding Great Bulgaria on the Balkan Peninsula. The peace treaty with Byzantium in 681 and the establishment of the new capital of Pliska south of the Danube is considered the beginning of the First Bulgarian Empire. At the same time, one of his brothers, Kuber, settled with another Bulgar group in what is now Macedonia. In 717, Bulgarians stopped the Arab siege of Constantinople, killing some 40,000-60,000 Arab soldiers, earning Bulgarian Khan Tervel a reputation as "The Savior of Europe." In 864, Bulgaria accepted the Orthodox Faith, and became a European power in the ninth and the tenth century, while fighting the Byzantine Empire for control of the Balkans. During the reign of Boris I, Bulgaria produced the Slavonic alphabet, which became a pillar for further cultural development. Centuries later, this alphabet along with the Old Bulgarian language became the intellectual written language (lingua franca) for Eastern Europe. The greatest territorial extension was reached under Simeon I of Bulgaria, the first tsar, son of Boris I, covering most of the Balkans. During his reign, Bulgaria developed a rich, unique Christian Slavonic culture, which became an example for the other Slavonic peoples in Eastern Europe and ensured the continued existence of the Bulgarian nation. Following a decline in the mid tenth century, worn out by the wars with Croatia and frequent Serbian rebellions sponsored by Byzantine gold, Bulgaria was crushed by an assault of the Kievan Rus in 969. 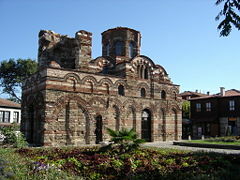 The Byzantines then began campaigns to conquer Bulgaria. In 971, they seized the capital Preslav and captured Emperor Boris II. Resistance continued under Tsar Samuil in the western Bulgarian lands for nearly half a century until the state was destroyed by the Byzantines led by Basil II in 1018. In 1185, the Second Bulgarian Empire once again established Bulgaria as an important power in Europe for two more centuries. With its capital based in Veliko Turnovo and under the Asenevtsi dynasty, this empire fought for dominance in the region against the Byzantine Empire, the Crusader states and Hungary, reaching its zenith under Ivan Asen II (1218–1241). By the end of the fourteenth century, the country had disintegrated into several feudal principalities and was eventually conquered by the Ottoman Empire. A Polish-Hungarian crusade under the rule of Władysław III of Poland to free the Balkans was crushed in 1444 in the Battle of Varna. The Ottomans reorganized the Bulgarian territories as the Beyerlik of Rumelia, ruled by a Beylerbey at Sofia. This territory, which included Moesia, Thrace and Macedonia, was divided into several sanjaks, each ruled by a Sanjak-bey accountable to the Beylerbey. A significant part of the conquered land was parceled out to the sultan's followers, who held it as feudal fiefs. That category of land could not be sold or inherited, but reverted to the Sultan when the fief holder died. The remainder of the land was organized as private possessions of the sultan or Ottoman nobility, and also as economic base for religious foundations. Bulgarians gave multiple regularly paid taxes as a tithe or various type of tax. The Ottomans did not normally require the Christians to convert to Islam. Nevertheless, there were many cases of individual or mass forced Islamization, especially in the Rhodopes. Non-Muslims did not serve in the sultan's army. The exception to this were some groups of the population, usually used for auxiliary or rear services, and the famous "tribute of children" (or blood tax), whereby every fifth young boy was taken to be trained as a warrior of the empire. These boys went through harsh religious and military training that turned them into an elite corps subservient to the sultan and an elite unit of the Ottoman army. Bulgarian nationalism emerged in the early nineteenth century under the influence of western ideas of liberalism and nationalism that trickled into the country after the French Revolution, mostly via Greece. The Greek revolt against the Ottomans, which began in 1821, influenced the small Bulgarian educated class. But Greek influence was limited by the general Bulgarian resentment of Greek control of the Bulgarian Church, and it was the struggle to revive an independent Bulgarian Church which first roused Bulgarian nationalist sentiment. In 1870, a Bulgarian Exarchate was created by a sultan's edict, and the first Bulgarian Exarch (Antim I) became the natural leader of the emerging nation. The Constantinople Patriarch reacted by excommunicating the Bulgarian Exarchate, which reinforced their will for independence. In April 1876, the Bulgarians revolted in the so-called “April Uprising.” The revolt was poorly organized, started before the planned date, and was largely confined to the region of Plovdiv. The uprising was crushed with cruelty by the Ottomans who also brought irregular Ottoman troops from outside the area. Countless villages were pillaged and tens of thousands of people were massacred, the majority of them in the insurgents' towns of Batak, Bulgaria, Perushtitsa and Bratsigovo in the area of Plovdiv. The massacres aroused a broad public reaction led by liberal Europeans such as William Gladstone, who launched a campaign against the "Bulgarian Horrors." The campaign was supported by a number of European intellectuals and public figures. 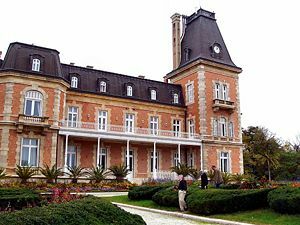 Ferdinand, a prince from the ducal family of Saxe-Coburg-Gotha, became the Bulgarian prince after Alexander von Battenberg abdicated in 1886 following a coup d'état staged by pro-Russian army officers. The struggle for liberation of the Bulgarians in the Adrianople, Vilayet and Macedonia continued throughout the late nineteenth and early twentieth centuries culminating with the Ilinden-Preobrazhenie Uprising, organized by the Internal Macedonian Revolutionary Organization (VMRO) in 1903. During World War I, Bulgaria found itself fighting on the losing side after its alliance with the Central Powers. The defeat led to new territorial losses; the Western Outlands to Serbia, Western Thrace to Greece and the re-conquered Southern Dobruja to Romania. The Balkan Wars and World War I led to the influx of over 250,000 Bulgarian refugees from Macedonia, Eastern and Western Thrace and Southern Dobruja. These numbers increased in the 1930s following Serbian state-sponsored aggression against its native Bulgarian population. Elections in March 1920 gave the Agrarians a large majority, and Agrarian Party leader Aleksandur Stamboliyski formed Bulgaria's first genuinely democratic government. In March 1923, Stamboliyski signed an agreement with Yugoslavia recognizing the new border and agreeing to suppress VMRO, which favored a war to regain Macedonia for Bulgaria. This triggered a nationalist reaction, and on June 9 there was a coup, after which Stamboliykski was beheaded. A right wing government under Aleksandar Tsankov took power, backed by the tsar, the army and the VMRO, who waged a terror campaign against the Agrarians and the communists. In 1926, the tsar persuaded Tsankov to resign and a more moderate government under Andrey Lyapchev took office. Amnesty was proclaimed, although the communists remained banned. The Agrarians reorganized and won elections in 1931. In May 1934 there was another coup, the Agrarians were again suppressed, and an authoritarian regime headed by Kimon Georgiev established with the backing of Tsar Boris. The tsar's regime banned all opposition parties and took Bulgaria into alliance with Nazi Germany and Fascist Italy. After regaining control over Southern Dobruja in 1940, Bulgaria allied with the Axis Powers in World War II, although no Bulgarian soldiers participated in the war against the USSR. During World War II, Nazi Germany allowed Bulgaria to occupy parts of Greece and Yugoslavia, including territories long coveted by the Bulgarians. Bulgaria was one of three countries (with Finland and Denmark) that saved its entire Jewish population (around 50,000) from the Nazi camps by refusing to comply with a resolution of August 31, 1943, but Jews in territories newly acquired from Greece and Yugoslavia were sent to death camps by the Bulgarian authorities on German request. In September 1944, the Soviet army entered Bulgaria, which later enabled the Bulgarian communists to seize power and establish a communist dictatorship. In 1944, Bulgaria's forces were turned against its former German ally (a 450,000 strong army in 1944, reduced to 130,000 in 1945). More than 30,000 Bulgarian soldiers and officers were killed in the war. From 1944-1989, the country was known as the "People's Republic of Bulgaria" (PRB) and was ruled by the Bulgarian Communist Party (BCP). Although Georgi Dimitrov had been in exile, mostly in the Soviet Union, since 1923, he was far from being a Soviet puppet. He had shown great courage in Nazi Germany during the Reichstag Fire trial of 1933, and had later headed the Comintern during the period of the Popular Front. He was also close to the Yugoslav communist leader Josip Broz Tito, and believed that Yugoslavia and Bulgaria, as closely related South Slav peoples, should form a federation. This idea was not favored by Josef Stalin, and there have long been suspicions that Dimitrov's sudden death in July 1949 was not accidental. It coincided with Stalin's expulsion of Tito from the Cominform, and was followed by a "Titoist" witchhunt in Bulgaria. This culminated in the show trial and execution of the deputy prime minister, Traicho Kostov. The elderly Kolarov died in 1950, and power then passed to an extreme Stalinist, Vulko Chervenkov. Bulgaria's Stalinist phase lasted less than five years. Agriculture was collectivized and peasant rebellions crushed. Labor camps were set up and at the height of the repression housed about 100,000 people. The Orthodox Patriarch was confined to a monastery and the church placed under state control. In 1950 diplomatic relations with the United States were broken off. The Turkish minority was persecuted, and border disputes with Greece and Yugoslavia revived. The country lived in a state of fear and isolation. But Chervenkov's support base even in the Communist Party was too narrow for him to survive long once his patron, Stalin, was gone. Stalin died in March 1953, and in March 1954 Chervenkov was deposed as party secretary with the approval of the new leadership in Moscow and replaced by Todor Zhivkov. Chervenkov stayed on as prime minister until April 1956, when he was finally dismissed and replaced by Anton Yugov. In February 1990, the Communist Party voluntarily gave up its claim on power and in June 1990 the first free elections since 1931 were held, won by the moderate wing of the Communist Party, renamed the Bulgarian Socialist Party. In July 1991, a new constitution was adopted, in which there was an elected president and a prime minister accountable to the legislature. The anti-communist Union of Democratic Forces (UDF) took office, and between 1992 and 1994, privatized land and industry, which brought massive unemployment and economic difficulties. The reaction against economic reform allowed the BSP to take office again in 1995, but by 1996 the BSP government was also in difficulties, and in the presidential elections of that year the UDF's Petar Stoyanov was elected. In 1997 the BSP government collapsed and the UDF came to power. Unemployment, however, remained high, and the electorate became increasingly dissatisfied with both parties. On June 17, 2001, Simeon Saxe-Coburg-Gotha, the son of Tsar Boris III and head of state as the tsar of Bulgaria from 1943 to 1946, won a narrow victory. The king's party—National Movement Simeon II ("NMSII")—won 120 out of 240 seats in parliament and overturned the two pre-existing political parties. Simeon's popularity declined during his four-year rule as prime minister and BSP won the elections in 2005. The politics of Bulgaria take place in a framework of a parliamentary representative democratic republic, whereby the minister-chairman is the head of government, and of a pluriform multi-party system. The president of Bulgaria is directly elected for a five-year term with the right to one re-election. The president serves as the head of state and commander in chief of the armed forces, schedules elections and referenda, represents Bulgaria abroad, concludes international treaties, and heads the Consultative Council for National Security. The president may return legislation to the National Assembly for further debate—a kind of veto—but the legislation can be passed again by an absolute majority vote. The Council of Ministers (cabinet) is usually formed by the majority party in Parliament, if one exists, or by the largest party in Parliament along with coalition partners. The chairman of the Council of Ministers (prime minister), and his deputy, are nominated by the president and elected by the National Assembly. Chaired by the prime minister, the Council of Ministers is responsible for carrying out state policy, managing the state budget, and maintaining law and order. The Bulgarian unicameral parliament, the National Assembly or Narodno Sabranie, consists of 240 deputies who are elected to four-year terms by popular vote. The votes are for party or coalition lists of candidates for each of the 28 administrative divisions. A party or coalition must garner a minimum of four percent of the vote in order to enter parliament. Parliament enacts laws, approves the budget, schedules presidential elections, selects and dismisses the prime minister and other ministers, declares war, deploys of troops outside of Bulgaria, and ratifies international treaties and agreements. Suffrage is universal to those aged 18 years and over. The Bulgarian judicial system consists of regional, district and appeal courts, as well as a Supreme Court of Cassation. In addition, there is a Supreme Administrative Court and a system of military courts. The presidents of the Supreme Court of Cassation, Supreme Administrative Court and the Prosecutor General are elected by a qualified majority of two-thirds from all the members of the Supreme Judicial Council and are appointed by the president. The Supreme Judicial Council is in charge of the self-administration and organization of the Judiciary. The Constitutional Court is in charge of reviewing the constitutionality of laws and statutes brought before it, as well as the compliance of these laws with international treaties that the government has signed. Parliament elects the 12 members of the Constitutional Court by a two-thirds majority; the members serve a nine-year term. After the fall of communist regime, crime escalated—mostly property and car theft. Allegations of corruption are widespread, and organized crime is believed to control some economic sectors. Bulgaria joined NATO in 2004 and signed the Treaty of Accession in 2005. It became a full member of the European Union in 2007. The country has been a member of the United Nations since 1955, and is a founding member of Organization for Security and Co-operation in Europe. As a consultative party to the Antarctic Treaty, Bulgaria takes part in the governing of the territories situated south of 60° south latitude. The Military of Bulgaria comprises the Bulgarian land forces, Bulgarian Navy and Bulgarian Air Force. Following a series of reductions beginning in 1989, the active troops of Bulgaria's army number as many as 68,450. Reserve forces include 303,000 soldiers and officers. "PLAN 2004" is an effort to modernize Bulgaria's armed forces. Compulsory military service was to be abolished in 2008. Bulgarian military personnel have been involved in international missions in Cambodia, Bosnia and Herzegovina, Kosovo, Afghanistan and Iraq. 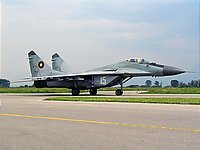 In April 2006, Bulgaria and the United States signed a defense cooperation agreement providing for the development of the Bulgarian air bases at Bezmer and Graf Ignatievo, the Novo Selo training range, and a logistics centre in Aytos as joint U.S.-Bulgarian military facilities. Bulgaria's navy is comprised mainly of Soviet-era ships and two submarines. Bulgaria's air forces also use a large amount of Soviet equipment. Plans to acquire transport and attack helicopters are underway, in addition to an overhaul on old Soviet weapons and GPS systems. The economy of Bulgaria declined dramatically during the 1990s with the collapse of the COMECON system, an economic organization of communist states, and the loss of the Soviet market, to which the Bulgarian economy had been closely tied. The standard of living fell by about 40 percent, and only regained pre-1989 levels by June 2004. In addition, United Nations economic sanctions against Serbia (1992-1995) and Iraq took a heavy toll on the Bulgarian economy. The first signs of recovery emerged when gross domestic product grew 1.4 percent in 1994 for the first time since 1988, and 2.5 percent in 1995. Inflation, which surged in 1994 to 122 percent, fell to 32.9 percent in 1995. 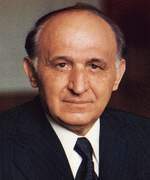 During 1996, however, the economy collapsed due to the Bulgarian Socialist Party's slow and mismanaged economic reforms, its disastrous agricultural policy, and an unstable and decentralized banking system, which led to an inflation rate of 311 percent and the collapse of the lev, the Bulgarian currency. When pro-reform forces came into power in the spring of 1997, an ambitious economic reform package was agreed to with the International Monetary Fund and the World Bank, and the economy began to stabilize. As of 2007 the economy is growing at a steady pace of above five percent a year with budget deficits and shaky inflation. Future prospects are tied to the country's increasingly important integration with the European Union member states. The country is expected to join the Eurozone between 2010 and 2012. Agricultural output has decreased since 1989, but production has been growing. The prevalence of mechanization is higher than most other Eastern European countries, but there is lack of modern equipment. Alongside aircraft and other equipment, there are over 150,000 tractors and 10,000 combine harvesters. The most important crops include wheat, sunflowers, maize, grapes, tobacco, tomatoes, barley, potatoes and roses (for rose oil). Although Bulgaria is not rich in reserves of coal, oil, and gas, it is a major producer of electricity and the most important exporter in the region due to the Kozloduy Nuclear Power Plant, which has a total capacity of 3,760 megawatts. A second plant, the Belene Nuclear Power Plant, has a capacity of two thousand megawatts and is under construction. There is a US$1.4 billion project for construction of an additional 670 megawatts for the 500-megawatt Maritsa Iztok Thermal Power Plant. The production of steel and pig iron is concentrated in Kremikovtsi and Pernik. There is a third metallurgical base in Debelt. There are refineries for lead and zinc, copper, and aluminum. About 14 percent of the total industrial production is related to machine building. Electronics and electric equipment production is well-developed. Plants at Sofia, Plovdiv and surrounding areas produce household appliances, computers, CDs, telephones, medical and scientific equipment. There are plants producing trains, trams, trolleys, buses, trucks, and motor cars. The main center of agricultural machinery is Ruse. Shipbuilding is concentrated in Varna, Burgas and Ruse. Arms production is mainly developed in central Bulgaria. Bulgaria's strategic location, highly-qualified workforce, and good education make it an attractive location for multinational companies. Hewlett-Packard built its Global Service Centre for Europe, the Middle East and Africa in Sofia. The inventor of the earliest known electronic computer, John Atanasoff, is of Bulgarian descent. Bulgaria was a major supplier of scientific and research instruments for the Soviet space programs, was the first European country to develop serial computer production, and has experience in pharmaceutical research and development. The Bulgarian Academy of Sciences is the leading scientific institution in the country with most of the researchers working for its numerous branches. There are two major astronomical observatories: the Rozhen Observatory, which is the biggest in South Eastern Europe, and the Belogradchik Observatory, with three telescopes. In winter, Samokov, Borovets, Bansko and Pamporovo are popular ski resorts. There are summer resorts on the Black Sea at Sozopol, Nessebur, Golden Sands, Sunny Beach, Sveti Vlas, Albena, St. Constantine and Helena, and many others. Spa resorts such as Bankya, Hisarya, Sandanski, Velingrad, Varshets and many others are popular all over the year. Bulgaria is becoming an attractive destination because of the quality of the resorts and prices below those found in Western Europe. Bulgaria has enjoyed a substantial growth in income from international tourism over the past decade. Beach resorts are popular with tourists from Germany, Russia, Scandinavia and the United Kingdom. The ski resorts are a favorite destination for British and Irish tourists. Most agricultural land was restored to former (pre-collectivization) owners or heirs following the collapse of communism, and legislation in 1997 restored forests to former owners. Most pre-collectivization landholdings were small. 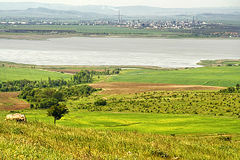 Ownership of agricultural land and forests is restricted to Bulgarian citizens, government entities, and organizations. Foreigners, however, are permitted use rights. Foreigners attracted by relatively cheap property have boosted the property market. Exports totaled $15.5 billion in 2006. Export commodities included clothing, footwear, iron and steel, machinery and equipment, and fuels. Export partners included Italy (12 percent), Turkey (10.5 percent), Germany (9.8 percent), Greece (9.5 percent), Belgium (5.9 percent), and France (4.6 percent). Imports totaled $23.8 billion. Import commodities included machinery and equipment; metals and ores; chemicals and plastics; fuels, minerals, and raw materials. Import partners included Russia (15.6 percent), Germany (13.6 percent), Italy (nine percent), Turkey (6.1 percent), Greece (five percent), and France (4.7 percent). Per capita GDP was $10,843 in 2007, or 65th on a list of 194 countries. The unemployment rate in 2006 was 9.6 percent. About 14.1 percent of the population was below the poverty line in 2003. Bulgaria has had one of the slowest population growth rates in the world. Growth has been negative since the early 1990s due to the economic collapse and high emigration. Bulgaria's population was 7,679,290 in 2007, a decline of 1.5 million since 1989. Bulgaria suffers a heavy demographic crisis. Life expectancy at birth for the total population was 72.03 years in 2005—68.41 years for men and 75.87 years for women. According to the 2001 census, Bulgaria's population is mainly ethnic Bulgarian (83.9 percent), with two sizable minorities, Turks (9.4 percent) and Roma (4.7 percent). Of the remaining two percent, 0.9 percent are distributed among some 40 smaller minorities, the most numerous of which are the Russians, Armenians, Vlachs, Jews, Crimean Tatars and Karakachans. The remaining 1.1 percent did not declare their ethnicity. 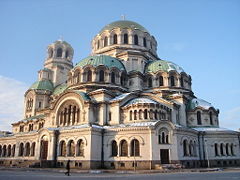 Bulgaria has been a traditionally Christian state since the adoption of Christianity in 865, with the dominant confession being Eastern Orthodoxy of the Bulgarian Orthodox Church. During the Ottoman rule of the Balkans, Islam established itself in Bulgaria, while Roman Catholicism has roots in the country since the Middle Ages, and Protestantism arrived in the nineteenth century. Despite this plurality of religions, unlike the Western Balkans, Bulgaria has not experienced any significant-scale confrontation between Christianity and Islam (as was the case in Bosnia, Kosovo, Serbia and the Republic of Macedonia in the 1990s and 2000s). The religious communities in the country coexist peacefully. The freedom of religion and the religious equality are included in the Constitution of Bulgaria as inalienable rights of every citizen. In fact, the capital, Sofia, is known for its so-called "Triangle of Religious Tolerance": the St. Nedelya Church, Banya Bashi Mosque and Sofia Synagogue are located within meters of each other in the center of the city. Most Bulgarians (82.6 percent) are, at least nominally, members of the Bulgarian Orthodox Church, the national Eastern Orthodox Church. Other religious denominations include Islam (12.2 percent), various Protestant denominations (0.8 percent), Roman Catholicism (0.5 percent), with other denominations, atheists and undeclared numbering ca. 4.1 percent. Bulgarian, the mother language of 84.8 percent of the population, is a South Slavic language of the Indo-European language family. Much vocabulary has been borrowed from Russian, Greek, and Turkish, and the latter two have influenced Bulgarian grammar. 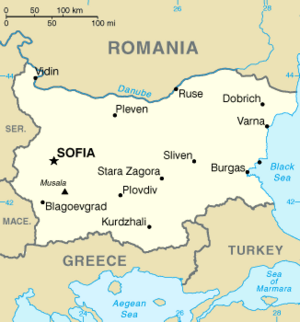 Bulgarian has two main dialects, eastern and western, and also local dialects. Bulgaria is also the birthplace of the Cyrillic alphabet, the second most widely used alphabet in the world, which was developed in these two schools in the tenth century. Bulgarian is the only official language, and is the language of instruction in schools, but other languages such as Turkish and Romany are spoken as well. Bulgarians marry by individual choice, although families may exert pressure on the choice of spouse. Only civil ceremonies are legally recognized, although a religious ceremony is permitted. Monogamy and marriage within an ethnic and religious group is the rule. Divorce was once rare, but has become less stigmatized in recent years. Whereas an extended, joint-family household was a common domestic unit in the past, a nuclear family with a grandparent or a married couple, their son and daughter-in-law, and grandchildren became common. Most have only one or two children. Since most women work, grandparents often care for grandchildren in three-generation households. After marriage, the new couple is likely to move in with the husband's parents. Both men and women own property such as land, buildings, and animals, and property is divided among all heirs rather than going to a single heir. Youngest sons, who bring their wives to live in the family home, often inherit houses. Kin groups tend to be informal networks of relatives. Physical discipline is uncommon, although children are brought up to defer to parental authority. With single-child families, considerable resources are devoted to their children's well-being and education. Bulgaria traditionally has had high educational standards. In the post-communist era, low funding and low teacher morale have damaged the system somewhat, particularly in vocational training. Adherence to classical teaching methods has handicapped development in some technical fields. The system of primary and secondary education, introduced in 1998, has 12 grades from age seven through age 16. Children may attend state-run kindergartens from age three to six. Schooling is free and compulsory. Ethnic Bulgarians value education and children are encouraged to do well, with many parents paying for private tutoring to ensure that their children pass entrance examinations for the better secondary schools. Bulgaria’s higher education system was fully reorganized in the mid-1990s. Between 1995 and 2002, the number of university graduates increased from 33,000 to 50,000. In 2002 some 42 institutions of higher learning were in operation, and 215,700 students were enrolled. In 2003 some 4.9 percent of Bulgaria’s national budget was devoted to education. In 2003 Bulgaria’s literacy rate was estimated at 98.6 percent, with approximately the same rate for both sexes. During the communist era, senior party officials, managers of state enterprises, and their kin formed the elite. The pre-communist elite had their property and means of wealth confiscated and nationalized. The fall of the communist regime and has brought a system where wealth determines status. Since 1989, the communist-era elite has acquired wealth through illegally taking control of state-owned assets. Otherwise, much new private wealth is derived from organized crime. The gap between the rich and the ordinary citizens has increased. The new elite tend to flaunt imposing dwellings, imported luxury goods and motor vehicles. 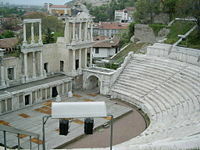 Bulgaria has nine UNESCO World Heritage Sites. Of these, two are Thracian tombs (one in Sveshtari and one in Kazanlak), three are monuments of medieval Bulgarian culture (the Boyana Church, the Rila Monastery and the Rock-hewn Churches of Ivanovo), while the Pirin National Park and the Srebarna Nature Reserve represent the country's natural beauty, and the ancient city of Nesebar is a unique combination of European cultural interaction, as well as, historically, one of the most important centers of naval trade in the Black Sea. In addition, the Varna Necropolis, a burial site dating from 3500-3200 B.C.E., contains what are believed to be the oldest examples of worked gold in the world. Soviet-style concrete apartment buildings and industrial developments were built around older-style homes and apartment buildings during the communist period. Educational and administrative buildings were located in the cities. Streets are wide and often cobbled, and there are numerous public parks, gardens, and playgrounds. Traditional houses in villages and towns are usually built of wood, have latticed windows, and are surrounded by high fences. National Revival period houses are brightly painted with second floors projecting over the street. Interiors often include carved wooden ceilings. Many churches date from the National Revival, and many Revival-era cultural centers are preserved. Bulgarian cuisine is essentially Slavic, but shows Turkish, Greek and Middle Eastern influences, as well as Armenian, Italian, Mediterranean and Hungarian ones. Owing to the relatively warm climate and diverse geography affording excellent growth conditions for a variety of vegetables, herbs and fruits, Bulgarian cuisine is particularly diverse. Famous for its rich salads required at every meal, Bulgarian cuisine is also noted for the diversity and quality of dairy products, particularly yogurt and white-brined cheese, and the variety of wines and local alcoholic drinks such as rakia, mastika and menta. 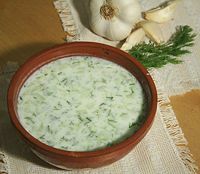 Bulgarian cuisine features also a variety of hot and cold soups, an example of a cold soup being tarator. 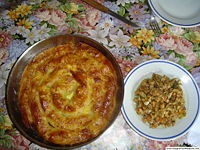 There are many different Bulgarian pastries as well such as banitsa. Certain entrées, salads, soups and dishes go well with alcoholic beverages and the alcohol of choice for some is Bulgarian wine. Home-cooked lunches and dinners often include soups, salads, stews, grilled meats, or stuffed vegetables, while meals away from home may consist of foods such as bread, cheese, sausage, and vegetables. Traditional Bulgarian foods include: yogurt, tarator (cold soup), Shopska salad, moussaka, sarma, pita bread, banitsa (a pastry filled with cheese and eggs), kebabche, mish-mash, kozunak, elenski but, shkembe (tripe soup), popara, bean soup, lyutika, lyutenitsa, flat sausages (soujouk), sirene (white brined cheese), kashkaval (yellow cheese), halva, honey, garash cake, kadaif dessert, and tolumbichki (fried dough). Bulgarian literature began in the late ninth century C.E., when numerous religious books were translated from Byzantine Greek. The earliest writings were religious. Bulgarian scholars and works spread Old Church Slavonic, the Cyrillic and the Glagolithic alphabet to Kievan Rus, Serbia and Croatia. The Second Bulgarian Empire in the fourteenth century brought another literary flowering with Patriarch Evtimiy, who founded the Tarnovo Literary School that influenced the literature of Serbia and Muscovite Russia. A literary tradition continued during the early Ottoman rule in northwestern Bulgaria up to the end of the seventeenth century among Bulgarian Catholics, who were supported by the Catholic states of Central Europe. Abagar, a breviary by the Bulgarian Roman Catholic Bishop of Nikopol, Filip Stanislavov, was printed in Rome in 1651, and is regarded as the first printed Bulgarian book. Bulgarian literature revived in the eighteenth century with the historiographical writings of Paisius of Hilendar, Istoriya Slavyanobolgarskaya. In the period 1840-1875, literature came alive with writings on mainly revolutionary, anti-Turkish themes. The noted poet and revolutionary Hristo Botev worked in the late nineteenth century and is regarded as arguably the foremost Bulgarian poet of the period. 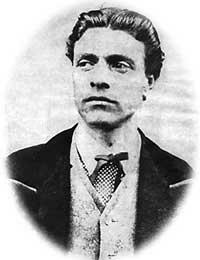 Among the writers who engaged in revolutionary activity was also Lyuben Karavelov. A typical feature of the period was the formation of an interest in Bulgarian folklore, as figures like the Miladinov Brothers and Kuzman Shapkarev made collections of folk songs and made ethnographic studies. After Bulgaria achieved independence (1878) the national literature lost much of its revolutionary spirit, and writings of a pastoral and regional type became more common. Ivan Vazov was the first professional Bulgarian man of letters. The poet Pencho Slaveykov brought other European literatures to the notice of Bulgarian readers. His epic Song of Blood (1911-1913) dealt with the struggle against the Turks. After the Second World War, Bulgarian literature fell under the control of the Communist Party and, particularly in the early years, was required to conform to the Stalinist style called "socialist realism." Bulgarian Revival and early modern literature continues to form the core of literature studies within the Bulgarian education system. Several Bulgarian authors and poets have achieved international fame. Bulgarian folk music is unique in its complex harmonies and highly irregular rhythms. These kinds of rhythms, also called uneven beats or asymmetric measures, were introduced to musicologists only in 1886 when music teacher Anastas Stoyan published Bulgarian folk melodies for the first time. Examples of such beats are 5/8, 7/8, 8/8, 9/8 and 11/8, or composite ones like (5+7)/8, (15+14)/8 and (9+5)/16 - (9+5)/16. Each area of Bulgaria has a characteristic music and dance style. Bulgarian folk music is said to have inspired modern western musicians such as Kate Bush and George Harrison. Bulgarian vocal style has a unique throat quality, while the singers themselves are renowned for their range. Their voices are low and soprano. Greek mythological figure Orpheus, the "father of songs," is said to be from Thrace, a region partly in Bulgaria. Diatonic scales predominate but in the Rhodope Mountains, for example, pentatonic scales occur, while in Thrace chromatic scales with augmented intervals (similar to the music of Classical Greece). Also, the intonation varies, and is quite different from the modern Western equal temperament. Depending on whether the melody moves up or down, an interval can augment or decrease by a quarter tone. Musical instruments (also characteristic of the whole Balkan region) include gaida (bagpipes), kaval (rim-blown flute), zurna or zurla (another woodwind), tambura (guitar-like), gadulka (violin-like), and tapan (large two-sided drum). Dances have complex steps matching the rhythm, and are often fast. Most are circle-dances or line dances called horo; but some are done singly or in pairs, like the 7/8 dance Rachenitsa. Traditional music and dance is often performed at weddings, and generally countryside fiestas. They are also performed in Bulgaria and abroad by amateur and professional performing artists. Philip Koutev, an influential musician of twentieth-century Bulgaria, updated rural music with more accessible harmonies. In 1951, Koutev founded the Bulgarian State Television Female Vocal Choir, which became famous worldwide after the release of a series of recordings entitled Le Mystère des Voix Bulgares. Thrace was an important center of folk fusion music, which was entirely underground during the Communist era until 1986, when a festival of this music was inaugurated in the town of Stambolovo. The festival became a biennial event, leading to the emergence of artists like Sever, Trakiîski Solisti, Shoumen and Juzhni Vetar, and especially clarinetist Ivo Papasov. A number of noted opera singers include Nicolai Ghiaurov, Boris Christoff, Raina Kabaivanska, and Ghena Dimitrova. Football is by far the most popular sport. Many Bulgarian fans follow the Bulgarian "A" Professional Football Group, as well as the leagues of other European countries. The greatest success of the Bulgariam national football team was a fourth-place finish at the 1994 FIFA World Cup in the United States. The best-known Bulgarian footballer is Hristo Stoichkov. Maria Gigova and Maria Petrova each have a record of three world titles in rhythmic gymnastics. Some other famous gymnasts include Simona Peycheva, Neshka Robeva and Yordan Yovtchev. Bulgarians dominate weightlifting, with around one thousand gold medals in different competitions, and wrestling. Stefan Botev, Nickolai Peshalov, Demir Demirev and Yoto Yotov are among the most distinguished weightlifters, and Serafim Barzakov, Armen Nazarian and Sergey Moreyko are world-class wrestlers. Stefka Kostadinova holds the women's high jump world record of 209 centimeters at the 1987 world championships in Rome. The Bulgarian men's national volleyball team is one of the strongest teams in Europe, ranked fifth in the FIVB ranklist. One of the top chess-masters in the world, Veselin Topalov, is Bulgarian. At the end of 2005, both men's and women's world chess champions were Bulgarian as well as the junior world champion. At the 1998 Winter Olympics, Ekaterina Dafovska won the Olympic title from 15 kilometer competition in biathlon, and Irina Nikulchina took a bronze medal at the same Olympic Games. Albena Denkova and Maxim Staviski are reigning world champions in ice dancing and figure skating, holding the title for both 2006 and 2007. ↑ National Statistical Institute of Bulgaria, 2011 census (in Bulgarian). Retrieved January 10, 2012. ↑ 2.0 2.1 IMF World Economic Outlook Database, September 2011. International Monetary Fund (2011). Retrieved January 12, 2012. ↑ Distribution of family income – Gini index. The World Factbook. CIA. Retrieved January 10, 2012. This page was last modified on 21 December 2016, at 16:04.